The PROFIBUS master terminal EL6731 corresponds to the Beckhoff FC3101 PROFIBUS PCI card. Due to the connection via EtherCAT, no PCI slots are required in the PC. The terminal controls the PROFIBUS protocol with all its features. 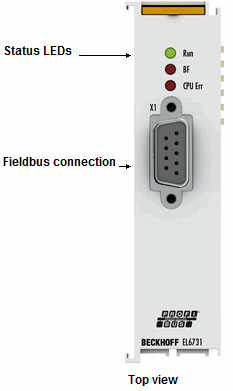 Within an EtherCAT Terminal network, it enables the integration of any PROFIBUS devices. Thanks to the PROFIBUS chip developed in-house, the terminal is equipped with the latest version of the PROFIBUS technology – including high-precision isochronous mode for axis control and expanded diagnostic options. These masters are the only ones that support different poll rates for the slaves. Cycle times from 200 µs are possible. It is possible to read the bus configuration and automatically assign the “GSD” files. The EL6731 is optionally also available as a slave version.